Heat sealers table top -are available as table top rotary band sealer, table top impulse heat sealer and constant heat sealers. 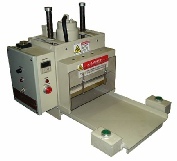 Also table top blister sealers, tray heat sealers and table top heat seal presses. Click on pictures for details. Contact us for pricing information and specifications.